I had the same problem with a different laptop you need find proper Vbios but there is no Guaranty that it will gonna work. 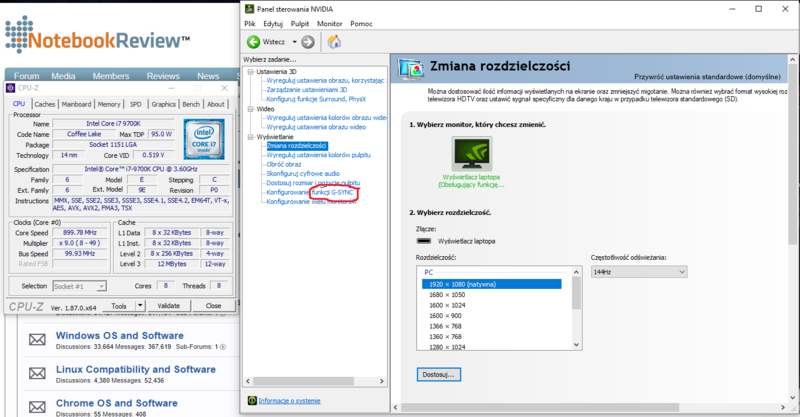 I have the same code when try to install Nvidia Quadro K5000m. the card detected and worked until 1-st reboot. and after Blue Screen.After I found Vbios after flashing it. got black screen but HDMI worked but no internal screen. As we though - G-SYNC is back on with new 144hz screen on P870KM1-G Also no need to reinstall anything - working like charm. How it is compared with the previous 1440P 120hz? Great. How many did you payd for 144hz and did you changed cable? Hey there, tiny question regarding the Clevo P870KM Systems. From what I gathered in these forums is that The Bios Mods found for the P870KM Models are only supporting either the 8th gen or the 9th gen but not both? Also both need the Pin mod to work, is that correct? Because whatever Clevo representative claimed that their "in-house modded" Version for the P870KM would support both 6th/7th/8th/9th gen without changing anything and also it would not need the pin modification for it to work properly. Does it mean the Clevo Bios solution is different from the one provided here? And is this even possible or are they janking the consumers chain here? I would love to have some insight into it. I had 75hz screen previously. I don't play FPS games that much so probably wont use that 144hz frequently - but i was missing g-sync so im really satisfied. And also 144hz for one 1080 is a bit overkill in my opinion. I would have to play in medium/low settings to hold 144fps in most games. I bought it from @Frits@LaptopParts4Less for around 105 euro with cable. Really satisfied with their service. And yes, i changed cable. I don't know which re seller you're talking about. But most probably it is this free bios branded "as theirs" (which in my opinion is just theft). Just to make extra money on someone else work. This bios is supporting all gens of CPU. In some cases other gens than 9th may work at lower cloak speeds. You can use this BIOS without pin modes. it just might burn 2 pins on motherboard - which noticeably wont affect anything like performance or stability. Does anyone know if after applying this Bios mod you can still use legacy (NON UEFI) boot? For example if you have an operating system that is installed to an internal drive using Legacy rather than UEFI will it still function after this BIOS mod and changing boot mode to Legacy CSM? Also can anyone verify whether the Legacy boot (CSM) option is still available after applying this BIOS mod? I believe so but you can always go back.